Get feedback for your upcoming or live campaign to increase backer conversion. Get feedback for your upcoming, live, or InDemand campaign to increase backer conversion. Get feedback from frequent online shoppers for your store and product pages. Get feedback for your Amazon listing to improve the presentation and increase conversion. It’s a community of real users who frequently shop online and back crowdfunding campaigns. They’ll provide honest and detailed feedback about the design of your page, pricing, structure, photos, videos, and more. Download a sample report here. Access the Gadget Flow community to get feedback for your product or crowdfunding project. Apply the feedback to improve your page and increase the conversion rate. Add or remove elements from your product page that affect its performance. Wondering how your idea will perform with crowdfunding? Test it with our community. Request one or more reviews for your product. Our system will assign the reviews to the best candidates. We’ll deliver the final reviews within 24 hours. All of our plans include 24/7 customer support via phone, email, or live chat. One user will fully review your page, pricing, structure, photos, videos, and more. 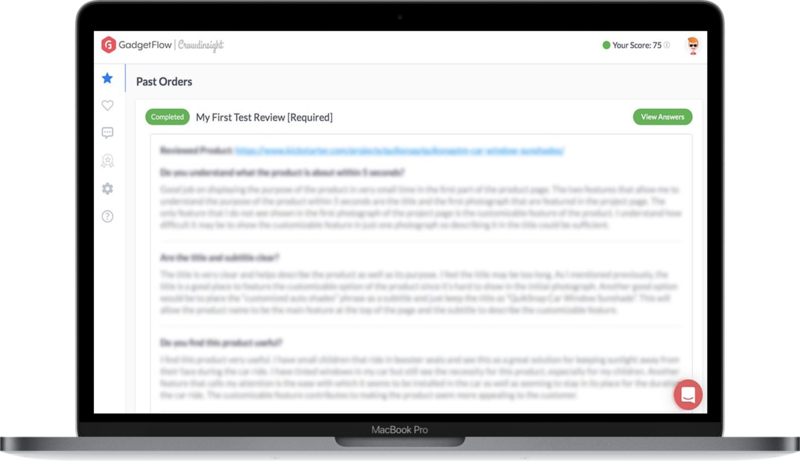 Three users will fully review your page for more dynamic feedback. Want to review products for us and get paid? See if you qualify.